The Doolittle Raid on Japan in April 1942 demolished the Japanese military's perception that their homeland was immune from air attack. They realized that in order to protect Japan, their defensive perimeter had to be extended eastward. Midway, a tiny island a thousand miles from Hawaii became the target. up. The thin American defense consisted of three aircraft carriers (Hornet, Enterprise and Yorktown), eight cruisers, fourteen destroyers, and the aircraft stationed on Midway itself. The Yorktown, mauled in the Battle of the Coral Sea, limped into battle after band-aid repairs at Pearl Harbor. The Americans had surprise on their side, and luck. On June 4, they discovered the Japanese fleet northeast of Midway. An air battle quickly developed. The turning point came at mid-morning. The Japanese fighters were drawn down to sea level by attacking American torpedo bombers, the vast majority of which were destroyed. Their sacrifice cleared the skies above for the American dive-bombers. Within minutes three Japanese carriers were ablaze. Hiryu, the fourth Japanese carrier retaliated with an air attack sinking the Yorktown. That afternoon American aircraft caught the Hiryu, inflicting serious damage. The Japanese fleet retreated. The one-day battle reversed the tide of war in the Pacific, six months after Pearl Harbor. From that point on, Japan would be on the defensive. "The first enemy carrier planes to attack were 15 torpedo bombers. When first spotted by our screening ships and combat air patrol, they were still not visible from the carriers, but they soon appeared as tiny dark specks in the blue sky, a little above the horizon, on Akagi's starboard bow. The distant wings flashed in the sun. Occasionally one of the specks burst into a spark of flame and trailed black smoke as it fell into the water. Our fighters were on the job, and the enemy again seemed to be without fighter protection. Presently a report came in from a Zero group leader: 'All 15 enemy torpedo bombers shot down.' Nearly 50 Zeros had gone to intercept the unprotected enemy formation! Small wonder that it did not get through. The raiders closed in from both sides, barely skimming over the water. Flying in single columns, they were within five miles and seemed to be aiming straight for Akagi. I watched in breathless suspense, thinking how impossible it would be to dodge all their torpedoes. But these raiders, too, without protective escorts, were already being engaged by our fighters. On Akagi's flight deck all attention was fixed on the dramatic scene unfolding before us, and there was wild cheering and whistling as the raiders went down one after another. Of the 14 enemy torpedo bombers which came in from starboard, half were shot down, and only 5 remained of the original 12 planes to port. The survivors kept charging in as Akagi's opened fire with antiaircraft machine guns. 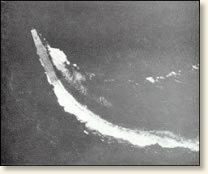 Both enemy groups reached their release points, and we watched for the splash of torpedoes aimed at Akagi. But, to our surprise, no drops were made. At the last moment the planes appeared to forsake Akagi, zoomed overhead, and made for Hiryu to port and astern of us. As the enemy planes passed Akagi, her gunners regained their composure and opened a sweeping fire, in which Hiryu joined. Through all this deadly gunfire the Zeros kept after the Americans, continually reducing their number. Seven enemy planes finally succeeded in launching their torpedoes at Hiryu, five from her starboard side and two from port. Our Zeros tenaciously pursued the retiring attackers as far as they could. Hiryu turned sharply to starboard to evade the torpedoes, and we watched anxiously to see if any would find their mark. A deep sigh of relief went up when no explosion occurred, and Hiryu soon turned her head to port and resumed her original course. A total of more than 40 enemy torpedo planes had been thrown against us in these attacks, but only seven American planes had survived long enough to release their missiles, and not a single hit had been scored. Nearly all of the raiding enemy planes were brought down." "Preparations for a counter-strike against the enemy had continued on board our four carriers throughout the enemy torpedo attacks. One after another, planes were hoisted from the hangar and quickly arranged on the flight deck. There was no time to lose. At 1020 Admiral Nagumo gave the order to launch when ready. On Akagi's flight deck all planes were in position with engines warming up. The big ship began turning into the wind. Within five minutes all her planes would be launched. Five minutes! Who would have dreamed that the tide of battle would shift completely in that brief interval of time? number of black objects suddenly floated eerily from their wings. Bombs! Down they came straight toward me! I fell intuitively to the deck and crawled behind a command post mantelet [rolled mattresses providing protection from shrapnel]. The terrifying scream of the dive-bombers reached me first, followed by the crashing explosion of a direct hit. There was a blinding flash and then a second explosion, much louder than the first. I was shaken by a weird blast of warm air. There was still another shock, but less severe, apparently a near miss. Then followed a startling quiet as the barking of guns suddenly ceased. I got up and looked at the sky. The enemy planes were already gone from sight. The attackers had gotten in unimpeded because our fighters, which had engaged the preceding wave of torpedo planes only a few moments earlier, had not yet had time to regain altitude. Consequently, it may be said that the American dive-bombers' success was made possible by the earlier martyrdom of their torpedo planes. Also, our carriers had no time to evade because clouds hid the enemy's approach until he dove down to the attack. We had been caught flatfooted in the most vulnerable condition possible - decks loaded with planes armed and fueled for attack. Looking about, I was horrified at the destruction that had been wrought in a matter of seconds. There was a huge hole in the flight deck just behind the amidship elevator. The elevator itself, twisted like molten glass, was drooping into the hangar. Deck plates reeled upward in grotesque configurations. Planes stood tail up, belching livid flame and jet-black smoke. Reluctant tears streamed down my cheeks as I watched the fires spread, and I was terrified at the prospect of induced explosions which would surely doom the ship." Fuchida, Mitsuo and Masatake Okumiya, Midway, the Battle that Doomed Japan (1955); Lord, Walter, Incredible Victory, (1967). "The Battle of Midway, 1942" EyeWitness to History, www.eyewitnesstohistory.com (2001). Hear the radio announcement of the battle. The eyewitness - Mitsuo Fuchida - led the first wave of the air attack on Pearl Harbor. The Dauntless served as the Navy's principal bomber until mid-1944. The dive-bomber sank more tonnage than any other aircraft in the war.